Whether you’re a marketing professional or an entrepreneur looking to grow your business, it’s smart to take an international perspective. Even if you’re not ready to expand into foreign markets quite yet, you can plan for the future by keeping informed of international trends and by learning about other people’s experiences. These days, there’s lots of valuable information available online. Here are some of my favourite free resources, ones that I’ve found particularly helpful. All of them add new content on a regular basis, so you’ll want to keep them bookmarked! Interested in issues around international business and global marketing? You’ll want to bookmark these. Let’s start with the World Economic Forum, a website chock full of articles and reports that provide up-to-date facts & figures with an international perspective. Are you in the tourism industry, for instance? Check out the WEF’s Travel & Tourism Competitiveness Report 2015. There are also lots of interesting list posts, such as the 10 cities that will contribute most to global economic growth by 2030. The Pew Research Center’s Fact Tank publications tend to focus on opinion trends in the U.S., specifically. But you’ll also find many survey reports that have an international angle. For instance, their recent report on approval ratings in the United States and Latin America regarding the renewal of U.S.-Cuba relations. The blog at We Are Social shares regular ‘statshots’ of digital usage around the world, based the latest data from Global Web Index and other well-known sources in the field of market research. You’ll find wide-scope articles, (e.g. Global Digital Statshot: August 2015) as well as country-specific ones (e.g. Digital, social & mobile in India in 2015) – SlideShare presentations and infographics included. McKinsey’s Insights & Publications section features content that global-minded entrepreneurs and marketers may find very helpful. For instance, “Five keys to connecting with China’s wired consumers” . Or this piece on why, in some emerging markets, the modern grocery-store model has been less than successful. Brand Quarterly‘s website gives you access to a wide range of high-quality articles on everything from brand development to business strategy to customer service to social media. But in particular, their Global category is a treasure trove if you’re looking for a more a international point of view. 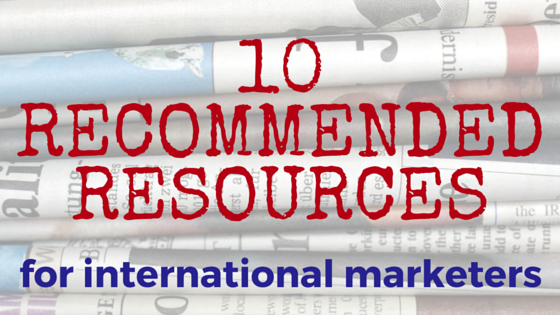 You’ll find insights from some of the top experts in international and global marketing today. A great place to start is BQ’s Global Marketing Special Edition, published in July 2015, which compiles over a dozen share-worthy articles. Lionbridge’s Content Hub is another great resource. It features some very practical posts on issues around global content, localization & translation, training & learning, and campaign management. Here’s their recent guide on “How to create a translation style guide and terminology glossary”, which are important tools for any multilingual strategy. Freedman International’s A Better Way Blog addresses many practical issues around the translation, transcreation and localization of content (e.g. “Spanish vs. Latin American – 10 Differences to Keep in Mind”), and offers advice on how to manage international projects (e.g. “Four steps to make your marketing campaign go global in style”). The Moravia Blog also has lots of helpful articles on planning your international, multilingual strategy. Take, for instance, “Mandarin or Cantonese? The savvy marketer’s guide to Hong Kong”. Or “#FAIL: It’s not the website translation, it’s the marketing”. Make sure to check out The International Entrepreneur Blog by Becky Park DeStigter. Becky shares personal insights and strategies, based on her many years of experience helping companies become more globally competitive. For instance, in one of her recent posts, she addresses the common question of whether a company should localize their product or service for a foreign market where English is widely spoken. Too busy to visit all these sites on a regular basis, let alone figure out which articles are worth your time? No problem! The Verbaccino magazine on Flipboard has you covered. It’s a curated selection of articles, my “best of” reading list from expert sources like the ones above, and I update it several times a week. Topics include economic trends, demographics, technology, emerging markets, social media, marketing news, intercultural issues, translation, localization, and more. Check it out here and consider following! Bonus resource: Verbaccino‘s free monthly newsletter, The Worldly Marketer has an ‘International & Global Marketing News’ section that gives you a shortlist of recent articles, chosen from among my Flipboard picks. There’s also a ‘Social Tip of the Month’, which offers practical advice on how to build an international audience on social media. And the #HolidayHeadsUp feature is a downloadable calendar that keeps you informed of major holidays and observances around the world for the coming month. Each entry includes a link to more information, so you can read up on whatever interests you. OK, your turn. How do you stay current on issues around international and global marketing? What are your favourite resources for insightful, up-to-date information? I’m always looking for new sources, so please share!